Next Monday, 9th July, Salesforce has kindly arranged its first Salesforce Comedy Club in aid of NCBI! The comedy gig is happening at the Laughter Lounge, 8 Eden Quay, North City, Dublin. Here’s a google map location of the venue; https://goo.gl/maps/e2aXUFGDawp. ‘The concept is simple: Professional comedians, the very best from the rich Dublin scene, will come on stage with one goal in mind: Make You Laugh! 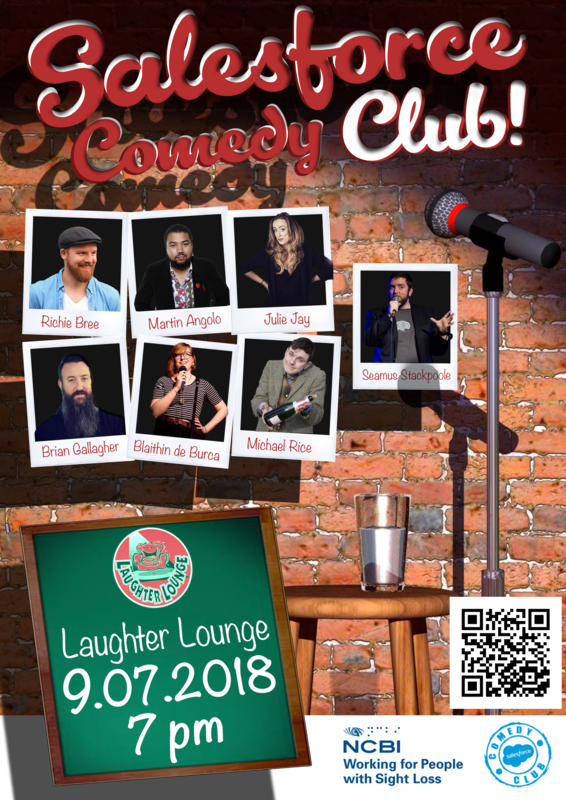 Julie Jay, Martin Angolo, Seasmus Stackpoole, Bláithín de Burca, Brian Gallagher, Michael Rice and Richie Bree will entertain you on July 11th with their best stand-up comedy performance and will make sure you laugh so hard that you’ll fall of your chairs. But is Salesforce Comedy Club just a joke? Well no, it’s more than that. It’s a real charity challenge that we initiated with National Council for the Blind of Ireland (NCBI) working for people with sight loss. The proceeds of the evening will be matched by Salesforce and entirely donated to this project. Our goal is ambitious: €4000 ,and with your support we can make it happen! It sounds like a great night! Laughter is a great medicine, after all and it would be great to support their fun and kind efforts for NCBI!